The Library is committed to furthering access to information and knowledge through advancements in information services—both high tech and low tech. The building and the collection it houses have grown to incorporate the needs of our growing and changing community. Your gift will enable the Library to continue its tradition of excellence. Donations may be made in cash, life insurance, or stocks. Planned giving can provide tax benefits for the donor. Ask the Library Director for more information. We appreciate your generosity. Thank you! Established as a tax-exempt nonprofit organization, the gifts and grants fund is managed by the Board of Trustees who oversee expenditures. 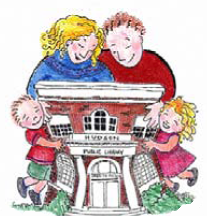 Income from the fund is used to enhance, enrich and supplement the quality and excellence of the Library. Donors may earmark donations for specific areas of interest, donate in memory of someone, or otherwise indicate how the gift is to be used. Charitable bequests are often deductible against federal estate taxes to the full value of the donation. Checks can be made out to “Hudson Public Library Miscellaneous Gifts” and either mailed or presented in person. Please call the Library Director at 978-568-9644 if you are interested in making a donation. Thank you! When you click on the Amazon.com logo here or on the homepage, a portion of any purchases you make through Amazon.com will be donated to the Library Gifts Fund. There is no additional charge to you while you help support the library. Our Friends of the Library group holds an annual book sale and toy sale. We accept donations at the library all year round. If you are looking to donate your time, the Friends of the Library always appreciate new members and volunteers. See the Friends of the Library page for more information.